DIE Veneris, 11 die Januarii. Hodie 2a vice lecta est Billa, "An Act for burying in Woollen only." 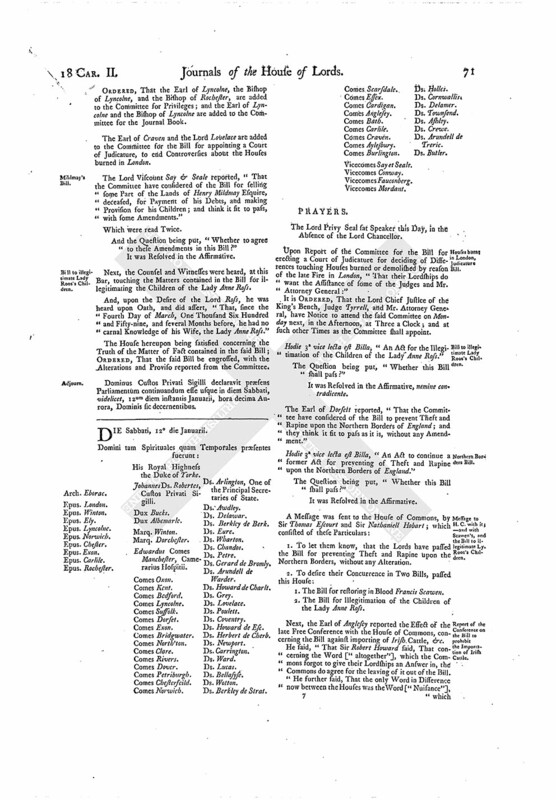 ORDERED, That the Earl of Lyncolne, the Bishop of Lyncolne, and the Bishop of Rochester, are added to the Committee for Privileges; and the Earl of Lyncolne and the Bishop of Lyncolne are added to the Committee for the Journal Book. 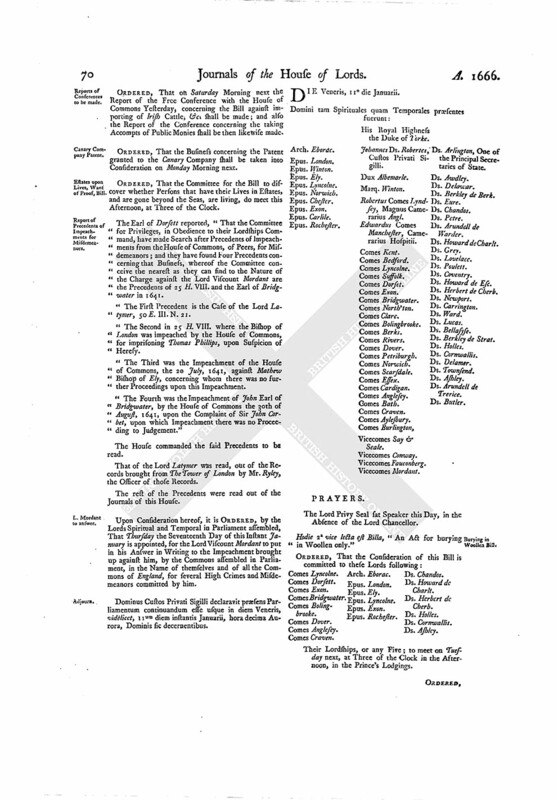 The Earl of Craven and the Lord Lovelace are added to the Committee for the Bill for appointing a Court of Judicature, to end Controversies about the Houses burned in London. The Lord Viscount Say & Seale reported, "That the Committee have considered of the Bill for selling some Part of the Lands of Henry Mildmay Esquire, deceased, for Payment of his Debts, and making Provision for his Children; and think it fit to pass, with some Amendments." And the Question being put, "Whether to agree to these Amendments in this Bill?" Next, the Counsel and Witnesses were heard, at this Bar, touching the Matters contained in the Bill for illegitimating the Children of the Lady Anne Ross. And, upon the Desire of the Lord Ross, he was heard upon Oath, and did assert, "That, since the Fourth Day of March, One Thousand Six Hundred and Fifty-nine, and several Months before, he had no carnal Knowledge of his Wife, the Lady Anne Ross." The House hereupon being satisfied concerning the Truth of the Matter of Fact contained in the said Bill; ORDERED, That the said Bill be engrossed, with the Alterations and Proviso reported from the Committee. Dominus Custos Privati Sigilli declaravit præsens Parliamentum continuandum esse usque in diem Sabbati, videlicet, 12um diem instantis Januarii, hora decima Aurora, Dominis sic decernentibus.